San Francisco (January 25, 2019) – By using Manheim’s first-of-its-kind Lot Vision tracking technology, locating nearly eight million vehicles registered annually at its physical auctions just got a whole lot easier. Lot Vision is a GPS-based wireless device placed in a vehicle’s on-board diagnostics port that reports its whereabouts within ten feet on a Manheim lot, reducing the typical search time from hours to minutes. Across Manheim’s physical sites spanning more than 6,500 acres, each vehicle is moved five to six times on average as it passes through service areas such as reconditioning, inspections and sale-day staging, making it a challenge to quickly find some units. In 2018 alone, the company moved vehicles 40 million times. It’s easy for dealers and transporters to use Lot Vision. They input a work order number and activate “Location Services” on a smart phone or tablet to pinpoint their exact vehicle location and a directional path to it. For vehicles without an on-board diagnostic port, trackers are attached to the steering wheel. In addition to making it simpler to find vehicles, Lot Vision speeds up vehicle processing and improves the client experience. Dealer clients and transporters can access tracking data, currently available at no charge, via the Lot Vision website at mymanheim.com/lotvision. In addition, those attending the 2019 NADA convention can check out a Lot Vision demo at Manheim booth #1709S. 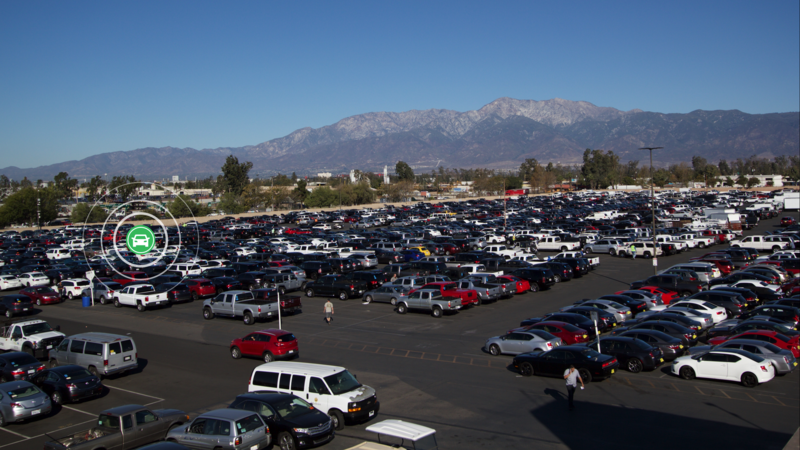 Account representatives can use the tool’s automated lot scanning process to more easily monitor inventory, while vendors improve productivity. The advanced technology is projected to boost auction work flow by roughly 75 percent by providing team members with enhanced vehicle data and streamlining scanning activities. Later this year, Manheim plans to examine other Lot Vision capabilities, including offering real-time vehicle diagnostic information, assessing remaining battery life and fluid levels. After extensive testing last year, Lot Vision is now in place at Manheim Toronto, Manheim West Palm Beach and Manheim Fort Lauderdale. By the end of the first quarter, Lot Vision will be available at four additional sites, including Manheim Orlando, one of the company’s largest locations. Lot Vision will expand to other Manheim sites nationwide this year. The company created Lot Vision partially in response to feedback from dealer clients. When asked about vehicle tracking technology, nearly all said they would embrace the innovation. Many stated they were eager to use it, with almost 90 percent finding the concept valuable and looking forward to having more confidence in their ability to locate vehicles, saving time and experiencing less hassles. “Lot Vision is the latest example of how we are continuing to enhance our clients’ experience,” said Huang. “Our team members and partners will now be able to identify – with pinpoint accuracy – each vehicle’s location and journey within various areas of the facility, such as reconditioning,” added Huang. Cox2M, Cox Communications new connected asset services business line, collaborated with Manheim to develop the GPS tracking hardware that powers Lot Vision. Manheim is Cox2M’s first customer to use this new technology and, when fully deployed, represents the largest LPWA (Low Power Wide Area) commercial IoT deployment in North America. As Lot Vision’s technology extends beyond Manheim lots, dealer clients such as Sonic Automotive and U.S. Auto Sales are now piloting this solution at a few dealerships. Other clients interested in this solution can work directly with Cox2M. Cox2M is an Internet of Things (IoT) business line within Cox Communications that provides complete asset tracking and monitoring solutions. Purpose-designed sensors collect data from a variety of connected assets (everything from cars to power lines), enabling you to track, monitor, and manage both mobile and fixed assets at an industry-leading price-point. For more information, visit www.cox2m.com.